This entry was posted in Weeklong Test Drive and tagged Private Blend, Tom Ford. Bookmark the permalink. Wow, being handed a sample bag just because – I wish! I’m happy for you! There are a few Tom Ford perfumes I like a lot, my absolute favorite is (of course) Amber Absolute. I’m looking forward to TF week! (writing down) Amber Absolute. I haven’t tried this one yet. I hope it’s not discontinued. So far all your amber recommendations worked for me so I want to try AA as well. I second the “wow”. That’s never happened to me, for sure! I am currently enamored by Violet Blonde, and own Black Orchid, Black Orchid Voile de Fleur, and Tom Ford for Men (kidnapped from my husband who didn’t appreciate it enough). ;) I haven’t experienced the Private Blends and my wallet is thankful. *jen, glad to see you here. As I mentioned above, I like Black Orchid (I own a mini bottle but might pick up a FB at some point) and still testing Black Orchid Voile de Fleur. Private Blends are too expensive :( I mean, if I wanted to have just one perfume it would have been alright, I wouldn’t mind to pay for a perfume I love. But as one out of N perfumes in my collection… I don’t know. I’m over the moon if I get a sample when I ask for one, let alone being chased after and handed one without asking! Nice one. Did you mention you were a blogger? Not that it probably makes any difference. I had pretty much written off the Tom Ford line as not for me after trying a few, but guess I will have to re-visit after reading some good things about them. Have fun with the WTD and I look forward to reading the results! Tara, I didn’t even talk to that SA! I smelled two or three perfumes, made my vSO smell one of them and we were leaving since he was patient enough in the preceding 20 minutes and I didn’t want to torture him any more. There wasn’t even her card in there! I had to ask for it. I hope she still works in that department if I decide to go back and buy one of the perfumes. Triple wow in that case then! I’m really looking forward to this test drive. I am not really familiar with TF as a whole, so it will be nice to use your posts to “tour” the line systematically. Anything I can do to help a fellow-perfumista! I’m looking forward to read about Tom Ford. They are not sold here as far as I’m being aware of and I’ve never tried any, but I see them mentioned a lot so I’m very curious. No Tom Ford at all? Not even a Signature collection? Well, I hope there are other brands not available here to compensate for that unfairness. I did have that experience in an olde worlde independent perfumery in Germany once. Simply to “reward” me for taking ages looking round their store, the SA opened a drawer and presented me with a 10ml mini of Micallef Hiver (that I saw listed on The Perfumed Court for – I think – $30? ), a Floris, a Penhaligon’s, some Acqua di Parmas and other things I have forgotten now, but the Micallef really stays in my mind. TF-wise, I love Voile de Fleur, Neroli Portofino and Violet Blonde, and own a bottle of White Suede. Those might be the main ones I like in fact. You know, I think after today I’ll have to make an honest woman out of buy something from Tom Ford counter at my local Neiman Marcus: today the guy who works there offered to make me any samples I wanted – just because I talked to him for a couple of minutes. I went there to try Amber Absolute recommended by Birgit. I got the sample of this perfume as well as of two others – I decided not to be greedy and not to ask for more. But I was impressed. 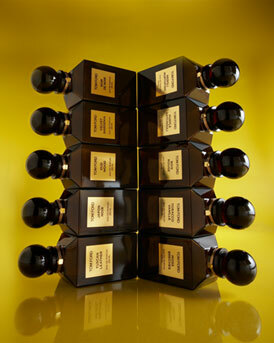 I enjoy sniffing Tom Ford fragrances…they are usually pretty distinctive, something that I appreciate. I’m not a fan of Black Orchid, but I adore his Gardenia…which is, most unfortunately, discontinued. I haven’t tried Gardenia and, unless it just falls down from the sky, probably won’t get to try. Well, with it being discontinued, it’s probably for the best that I don’t know what I’m missing. Even when I ask in more upscale dept stores and Jo Malones, Dyptique, L’Occitane boutiques I have been told “no”….the only place that is good about making samples is Sephora which gives you three for free, no questions asked. IF you get a nice SA they fill it to the top (approximately 4ml) and then we are talking a mini decant x 3 which is even better! I do not go to Sephora too often (they just do not carry too many perfumes I’m interested in) but I haven’t seen them ever making any samples so I’ve never even asked. I usually can get a sample or two at Neiman Marcus and Saks. It’s easier at Nordstrom. And almost impossible at Macy’s or Bloomingdales (not that they have anything I’d like to try). How has your luck been at any of the Jo Malone boutiques? Next time I am in SAKS I am going to be a bit more bold and ask for samples! maybe your “luck” will rub off on me! I didn’t see any stand-alone JM boutiques so I wouldn’t know but so far everything I wanted to try I could get from Nordstrom.